Are you looking for a fun and easy gift basket for your neighbors, child’s teacher, boss, or best friend this holiday season? Gift baskets are a great way to add a personal touch. Putting together an adorable gift basket shouldn’t be time consuming or stressful. I did a one-stop shop for all my gift basket items at my local Baker’s Grocery store, which for this busy mama of four is uber convenient. 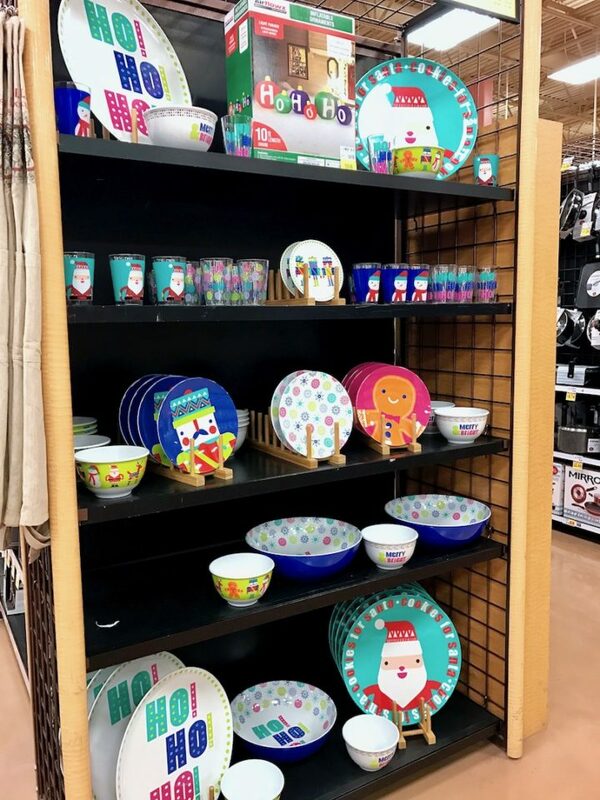  In their holiday shop, they have the cutest holiday-themed home items like big bowls (for party mixes), cute coffee mugs, and adorable kid’s cups and plates. After picking out a couple on-trend red plaid coffee mugs I headed over to the coffee aisle. I love to drink coffee by the gallon but I will be the first to admit that I don’t know everything there is to know about coffee. This is where picking up a bag of Baker’s Private Selection helped me out. On the back of the coffee bags and tea boxes, they offer recommendations for what to pair with that particular coffee or tea. Pretty dang handy, huh? I paired the fun selection of coffees, tea, and hot chocolate mixes with a few sweet and salty treats. Pretzel rods dipped in the almond bark are one of my favorite “quick treats.” Baker’s had a great selection of fun holiday-themed sprinkles to decorate the pretzel rods. I opted to decorate some with crushed candy canes and red hot cinnamon candies too. 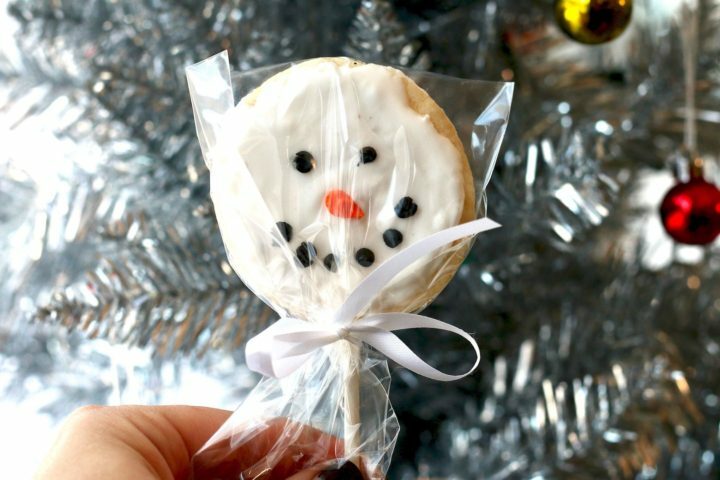 My most favorite addition to the gift basket is the sugar cookie snowman pops. You guys! This is a total cheaters baking project. I used sugar cookie dough from the refrigerator section. While there were still warm I slipped in a lolly pop stick. Once the cookies were completely cooled I decorated them using a simple royal icing. I used red + yellow food dye until I got an orange color I liked for the carrot nose. For the coal eyes and mouth, you could dye your icing black or use mini chocolate chips to make it even easier. 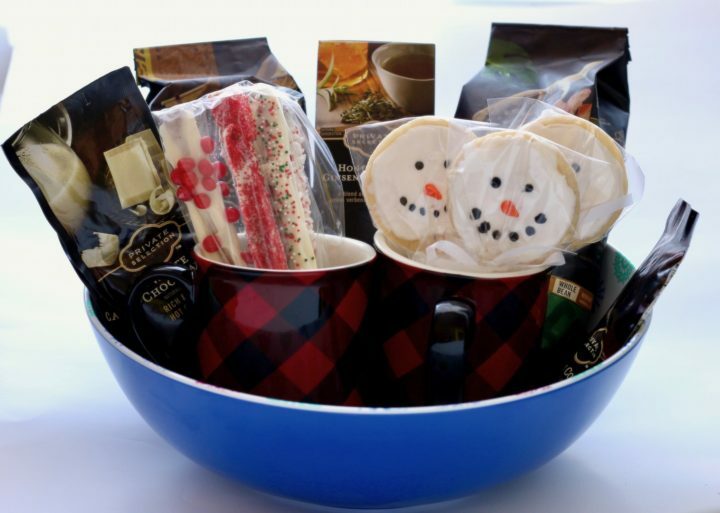 It will take you longer to pick out the mugs and bowl than it will to assemble this easy peasy DIY Holiday Gift Basket. 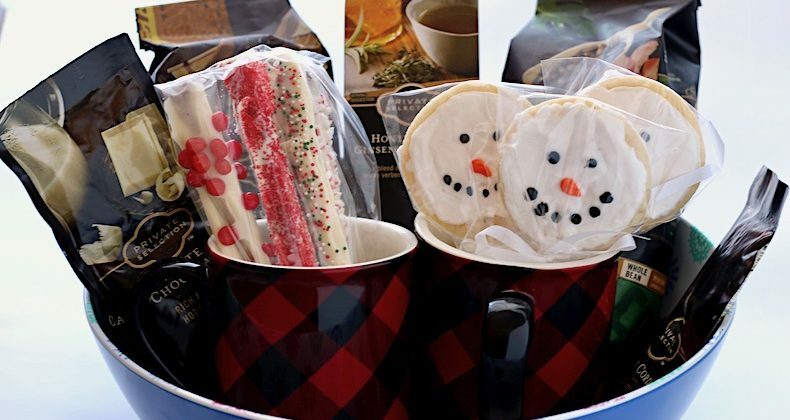 It could not get easier than placing the coffees, tea, and hot chocolate mixes in the big bowl followed by the coffee mugs filled with the homemade treats. Who would you give this basket to? You have some really great ideas there for the gift and the way you put the basket together. Love the mugs & what they’re holding! What fun! This would be such a fun hostess gift for the holiday season! Love those mugs!